As the Alpha Geek was getting dressed, I flopped on the bed and started chattering at him. Because what’s the point of being married to someone if you can’t inflict some mild torture on them once in a while? Well, I started to eat the apple, but it was all rotten inside. It looked okay, but then I took a bite and it was all black and sour and nasty. …so I spit it out. Isn’t it weird how something can look fine on the outside and then be all horrible on the inside? Appropos of nothing, this afternoon when I took the trash down to the street, there was a rabbit on the sidewalk cropping grass. He’d freeze whenever I passed by, but I purposely passed on the far side of the driveway and didn’t pay him any mind, so he didn’t run away. 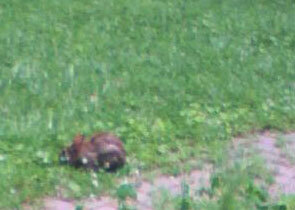 Picture’s kind of fuzzy cause I used the cell phone instead of hunting up the camera with a zoom. ISP Wiretapping Where’s My New Cat, Dammit?